is required! 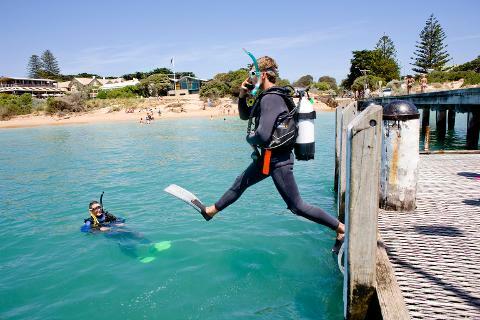 Our highly experienced, professional instructor will take you on an underwater adventure to see some of the beautiful marine life the Mornington Peninsula & Melbourne has to offer. Step 1: Learn the basic theory behind scuba diving in the comfort of a classroom enviroment. Step 2: Skills Session held in confined water blowing bubbles in shallow water allowing a comfortable transition to the underwater world. Here we introduce the skills necessary to maximise safety and comfort for the amazing dive ahead. Step 3: It's time to meet the marine life! Visit the Weedy Sea Dragon Colony or Nudi branch wall & sponge garden. This you will never forget! Tours take approximately 2 hours depending on group size & ability. Equipment hire, Transfers to & from Pool & Dive Site, Air fills, Scuba dive theory & skills session, then an ocean dive to one of our dive sites which is determined by conditions on the day. Bring a towel, bathers, and something dry to wear afterwards. Please be sure to bring a drink, snack or lunch. Age: Participants need to be aged 13 and above. A private course can be arranged for groups & or people who would like additional fees may apply. Please note that some medical conditions might prevent you from diving, including but not limited to : respiratory conditions (asthma, wheezing, chronic bronchitis or sinus conditions, tuberculosis, collapsed lung, any history of chest surgery), diabetes, epilepsy or fainting, brain/spinal/heart disorders, ear surgery or discharge, high blood pressure or pregnancy. If you are currently taking any medication, please contact us. Upon confirmation of your booking, you will receive a medical questionnaire which is a copy of the questionnaire you will fill on the day. If you answer YES to any of the questions, you will need to contact BAYPLAY on (03) 5984 0888 to discuss your options. Our local Dive Doctor is Dr Murrie (Ph (03) 5984 4322) and is based in Sorrento or visit www.spums.org.au for additional Dive Doctors in Melbourne. Click here to view the Medical Questionnaire. Please arrive 5 minutes prior to the start time. Should you have difficulty on the day diving, we will arrange a separate time for you to do a one on one dive with your instructor (additional fee applies). We offer Packages and Accommodation in a range of family holiday cottages, group retreats or Glamping in Portsea, Rye, Blairgowrie and Shoreham.